Peasants take to streets at climate meet - Climate Justice Now!Climate Justice Now! Waving rainbow and green flags, the demonstrators beat drums and played flutes as they set off on a 20-kilometer (12-mile) march from the center of Cancun to the guarded luxury hotel where talks were underway. 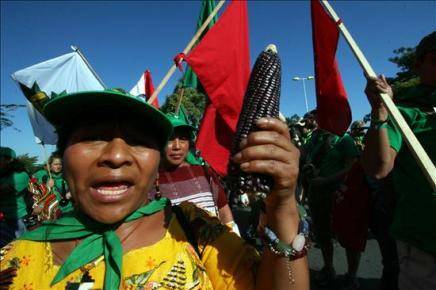 “We urgently need a 50 percent reduction in greenhouse gas emissions and we’re demanding that the United States, Japan, China and the Group of Eight to heed this plea from the world’s people,” said Rafael Alegria, a Honduran activist for the peasant movement Via Campesina. US activist Ash-Lee Woodard of the Grassroots Global Justice Alliance said that more than 30 similar demonstrations were taking place across North America for those who could not come to Cancun. “No agreement is better than a bad agreement,” she said. Protesters said they were opposed to any violence. Police official Veronica Fajardo said that some 5,000 to 6,000 police would patrol the streets and that they did not expect to close any roads. The talks in Cancun are making incremental progress toward a global deal on fighting climate change, with the conference focused largely on the architecture of a future agreement. The peasant activists have been particularly upset about an expected role of the World Bank and free markets in distributing the billions of dollars in aid being pledged by wealthy nations to the most vulnerable states. Many demonstrators also want a continuation of the Kyoto Protocol, whose requirements run out at the end of 2012, faced with the growing likelihood that a new treaty will not yet be in place. 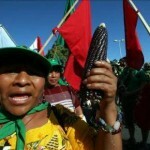 This entry was posted in Cancun / Mobilisations, COP 16 Cancun, Media, Photos by admin. Bookmark the permalink.